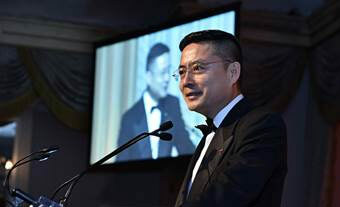 At their 34th Annual Awards Gala on November 2nd at The Pierre Hotel in New York City, Calvary Hospital raised nearly $1,000,000 for programs and services benefiting Calvary patients and their families. Ryan Field, WABC-TV Sports Anchor, served as the Master of Ceremonies. RAIN: A Tribute to the Beatles was the evening’s entertainment. 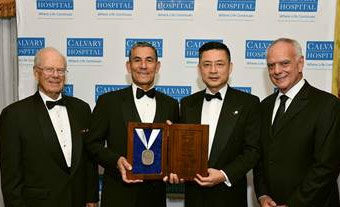 Carlos M. Hernandez, Head of Global Banking, JPMorgan Chase & Co., Chairman of the Board of the Calvary Fund presented The Calvary Medal to Adam Tan, Vice Chairman & Chief Executive Officer, HNA Group Co., Ltd. He was recognized for his distinguished corporate and civic leadership and outstanding philanthropic commitment to the Calvary mission. “Our objective with each annual gala is to honor someone whose leadership and philanthropic achievements are aligned with the Hospital’s mission of providing the best possible care for people and their families at the end of life,” said Mr. Hernandez. HNA Group, a global Fortune 500 company focused on tourism, logistics and financial services, has a rich history of citizenship and philanthropic endeavors. Since its founding in 1993, HNA Group has been involved in more than 40 charity projects and provided funding of over $400 million, focusing on welfare, healthcare, education, poverty alleviation and culture. 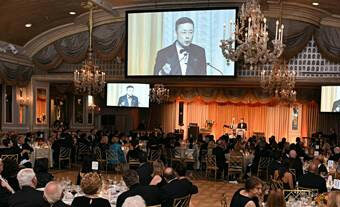 HNA Group is a global Fortune 500 company focused on tourism, logistics and financial services. Since its founding in 1993, HNA Group has evolved from a regional airline based on Hainan Island in southern China into a global company with approximately $145 billion of assets, over $90 billion in annual revenues, and an international workforce of 410,000 employees, primarily across America, Europe and Asia. HNA’s tourism business is a fast-growing, vertically-integrated global player with market-leading positions in aviation, hotels and travel services. Frank A. Calamari, President & CEO, Calvary Hospital. Pictured: Carlos M. Hernandez, Chairman of the Calvary Fund, presenting the Calvary Medal to Adam Tan, the 2017 honoree. Pictured: Mr. Tan, the 2017 Calvary Medalist, giving his remarks. 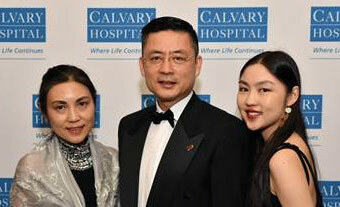 Pictured: Mr. Tan with his wife Christina and daughter Joyce. The day before Calvary’s 34th Annual Awards Gala, Adam Tan visited the Hospital’s Bronx campus and toured the facility with senior management. 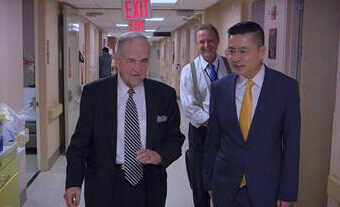 Pictured: Michael J. Brescia, MD, Executive Medical Director (left), Mr. Tan (right) and Christopher P. Comfort, MD, Medical Director (behind Mr. Tan). Pictured: A shot of the ballroom during Calvary’s 34th Annual Awards Gala on November 2nd.